Let me tell it to you briefly. Judah was one of the 12 sons of Jacob. He marries a Canaanite woman who bears him two sons: Er and Onan. Judah decides to take a wife for his son,her name is Tamar. Tamar’s husband Er was a worthless POS (not exactly how the Bible puts it, but you get the picture) so God kills him. Judah says to Onan, “Go in to your brother’s wife and marry her, and raise up an heir for your brother.” In ancient Israel, if a man died without male heirs, the wife had to sleep with his brothers to produce a male heir. Icky. But Onan had another idea. Because Onan knew that the heir wouldn’t be his, he decides to go “into” his brother’s wife, but emits on the ground at the last minute. Talk about the ultimate SCREW YOU! God didn’t like that either, so He kills Onan. Tamar is now in an awful situation. Judah sends Tamar back to her father (major disgrace by the way) and tells her to wait for his other son Shelah to grow up, and then he’ll give her to him as his wife. So Tamar waited….and waited….and waited. Still no Shelah. Judah must have seen Tamar as a bad omen, since guys that sleep with her seem to get struck dead, so he balks on his promise. Now it looks like Tamar is going to be in a perpetual state of disgrace for the rest of her life. No husband. No heirs. No future. This is where the story gets really good. 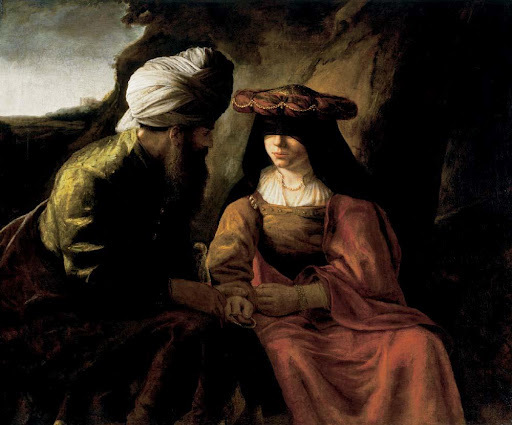 Judah realizes that the “harlot” was Tamar, and acknowledges that Tamar was more righteous than him, since he had not given Shelah to her as her husband. Tamar conceives of twins. One of the twins, Perez, becomes the great, great, great, great….ect….grandfather of Jesus the Messiah. There’s a lot in this story, but I want to focus on the fact that Tamar started out with an awful husband. Er was, as the Bible puts it “wicked.” Then one by one, every other man in her life “screws her” both literally and figuratively. Tamar finds herself disgraced and without a future…so she decides to take matters into her own hands. She could have chosen the path of revenge, but instead she decided to outsmart the man that had wronged her, and was vindicated in the end. It’s interesting that the Bible reflects (notice I said reflect, not prescribe. Big difference!) a patriarchal structure that favors men, yet is filled with stories of women outsmarting the men. So all you ladies that have been used and abused, is there a way you can outsmart the men who have harmed you, without repaying them evil in return? And they say the Bible is irrelevant…..
Tamar’s story is found in Genesis chapter 38. You can read the full story here. Ever feel like your life is falling apart? I do sometimes, until I go to Starbucks and sip my troubles away with a Carmel Mocha Frappuccino lite. Did I just admit that? Or I read the Book of Job. Job’s story is the ultimate one-upper. Ever been one-upped? You tell a sad story, and someone has a sadder story. Anyways, unless you’ve lost all of your children, all of your possessions, and boils all over your body, you’ve probably been one-upped by Job. Which I’m thinking is a good thing. If you feel like you are indeed a modern-day Job, as the expression goes, the good news is Job’s story ends well. In the end, God gives him twice as much as he had before. So take heart. “Oh earth, do not cover my blood, and let my cry have no resting place! Surely even now my witness is in heaven, and my evidence is on high. My friends scorn me, my eyes pour out tears to God. Oh that one might plead for a man with God, as a man pleads for his neighbor. For when a few years are finished, I shall go the way of no return” (italics emphasis mine). Job had no one to plead for him with God. Little Job against big God. God wins. Throughout the Book of Job we hear him crying out for an advocate. Somebody to stand between him and the one who held his fate in his hands. Imagine being tried for a crime with no one to represent you. That’s how Job felt. We know in hindsight that God wasn’t punishing Job for his sins, but Job didn’t know that. All he “knew” was that God was mad at him, and the case against him was rigged. The New Testament calls Jesus our mediator and our advocate. The hidden message of the Book of Job is how miserable life can be feeling like you have no one to represent you before the judge of all the earth. Thank God (and Jesus) we don’t have to feel that way anymore! As if we needed another reminder: the rich are getting richer and the poor are getting poorer. Workers are getting screwed. Here’s the proof.